Houttuynia cordata is a perennial plant that has been introduced as an ornamental for gardens. While the plant has apparently not escaped confinement, there is much fear that it will eventually present a huge risk to native habitats. It has a high reproductive and vegetative growth rate and quickly overtakes the gardens where it is planted. Control of this species is difficult as it will reproduce rhizomatically from fragments. H. cordata is a perennial ground cover plant. It is been marketed as a creeping ornamental garden plant, which has heart shaped leaves up to 75mm long and almost as wide. The leaves are comprised of a mixture of colours from green through yellow to red, the brighter colours being more prominent when grown in full sunlight. The leaves are opposite along thin erect stems which arise from slender rhizomes. The minute flowers are densely clustered on short spikes. At the base of each spike are four white petal-like parts (The Environment Bay of Plenty, 2003). The leaves of H. cordata are heart-shaped, usually variegated cream, bronze, scarlet and green, but may revert to a plain green colour, and have a peppery scent when crushed (National Pest Plant Accord, 2001). The National Pest Plant Accord (2001) states that, \"H. cordata is normally deciduous, dying back to the rootstock over winter, although it can be semi-evergreen in warm areas. The stems creep and spread from slender, couch-like rhizomes. When flowering, small spikes of minute flowers appear, each flower with four white petal-like bracts at the base. The plant spreads by both seeds and rhizome fragments.\"
The Plants for a Future (2001) database offers a variety of edible and medicinal uses of this species. Leaves can be eaten raw or cooked. There are mixed reports about the aromatic properties ranging from smelling like rotten fish to the authors statement that, \"Our experience is that the leaves have a delicious orange-like smell and make a marvelous flavouring in salads. The whole plant is antibacterial, antiphlogistic, depurative, diuretic, emmenagogue, febrifuge, laxative and ophthalmic. A decoction is used internally in the treatment of many ailments including cancer, coughs, dysentery, enteritis and fever. Its use is said to strengthen the immune system. Externally, it is used in the treatment of snakebites and skin disorders. The leaves and stems are harvested during the growing season and used fresh in decoctions. The leaf juice is antidote and astringent. A root extract is diuretic. The root is also said to be used in medicinal preparations for certain diseases of women. The rhizomes yield a sterol, resembling sitosterol, which stimulates the secretion of antibiotic substances from a gram-positive spore-forming bacillus. An active substance, effective in the treatment of stomach ulcers, has been extracted from the plant\" (Plants for a Future, 2001). 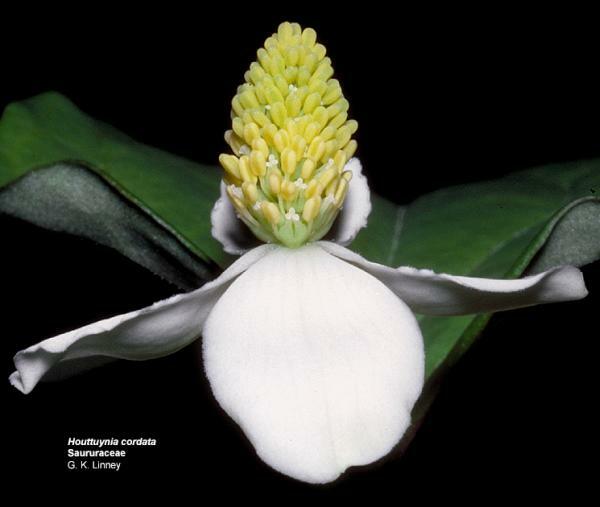 The Nature Conservancy (2001) reports that H. cordata can be found in shaded places in lowlands and forested banks. \"H. cordata's natural habitats are moist loamy soils, shallow water and low light situations. It thrives along the margins of ponds and waterways\" (Environment Bay of Plenty, 2003). \"Often cultivated in gardens, it can grow on forest floors and on the margins of freshwater lakes and ponds\" (National Pest Plant Accord, 2001). Plants for a Future (2001) report that H. cordata can be also found in bog gardens, on sunny edges, under dappled shade, and shady edges. The Environment Bay of Plenty (2003) states that, \"H. cordata is very easily propagated by division or cuttings, plant fragments can easily take root and form new infestations. These often establish from the indiscriminate dumping of garden refuse. Once established H. cordata can cover large areas assisted by creeping stolons and an extensive root system. H. cordata will also set viable seed.\"
Principal source: Environment Bay of Plenty, 2003. Pest Plant Control \"15\": Sustainable Options: Ground Cover - Pest Plants. Review: Dr. Neil Mitchell. School of Geography and Environmental Science. Tamaki Campus, University of Auckland. New Zealand. 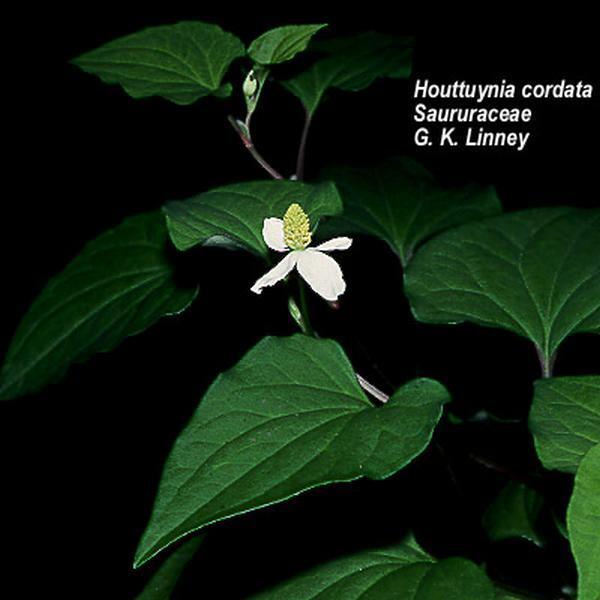 Recommended citation: Global Invasive Species Database (2019) Species profile: Houttuynia cordata. Downloaded from http://193.206.192.138/gisd/species.php?sc=854 on 26-04-2019. The Environment Bay of Plenty (2003) reports that \"H. cordata's rampant growth can rapidly displace native plants in forest and wetland ecosystems.\" \"This plant is only found in gardens so far, but is believed to present a huge risk to the native habitats. Any sightings of this plant should be reported to local authorities\" (National Pest Plant Accord, 2001). Hynes (2003, personal communication) reports that, \"Not only is H. cordata able to seed parthenogenetically (in the absence of male plants), but also every segment of it roots readily and grows effortlessly.\" Furthermore the author has noticed it being sold as a water plant in nurseries and states that, \"Obviously it can live in water as well as in soil.\" Hynes (2003) correlates H. cordata's spread with its immense appeal \"Because of the huge range of colours each leaf has but should someone in the nursery trade decide to push it - we will have a major pest that will be almost ineradicable.\"
Physical: The Environment Bay of Plenty (2003) suggests manually removing as much of the roots and plant material as possible and carrying out repeated removals at regular intervals. All uprooted plant material should be disposed of by incineration or taken to an official transfer station or landfill site. Chemical: Both the Environment Bay of Plenty (2003) and the National Pest Plant Accord (2001) report that certain herbicides may be used to control H. cordata but neither source details which herbicides to use for reasons that it is mostly a garden weed currently and extra caution must be used when applying herbicides in garden environment. If herbicide use are desired it is best to contact local authorities for further assistance and information. Informations on Houttuynia cordata has been recorded for the following locations. Click on the name for additional informations. Environment Bay of Plenty. 2003. Pest Plant Control 15 : Sustainable Options: Ground Cover - Pest Plants. Environment Bay of Plenty Regional Council Pest Plant Section. GardenWeb, Undated. Which plants are invasive in Georgia? Hynes, M. 2003. Personal communications. Email with H. Scott.. Nature Conservancy, 2001. Invasives Species Initiative listserve digest #091. Plants for a Future. 2001. Houttuynia cordata. Staples, G. W., D. Herbst, and C. T. Imada. 2000. Survey of invasive or ptentially invasive cultivated plants in Hawaii. Bishop Museum Occasional Papers: Number 65. USDA-GRIN (Germplasm Resources Information Network). 2005. Houttuynia cordata. National Genetic Resources Program [Online Database] National Germplasm Resources Laboratory, Beltsville, Maryland. USDA-NRCS (Natural Resource Conservation Service). 2005. Houttuynia cordata. The PLANTS Database Version 3.5 [Online Database] National Plant Data Center, Baton Rouge, LA.